Nike is riding high on its wave of fall Air Max releases lately. And while OVO fanatics await the release of the Air Max 1s next week, streetwear devotees rejoice this week with the release of the much-anticipated Stussy x Nike Air Max 95 collaborative pack. After teasing visuals early on, Nike and Stussy will release three tonal colorways of the classic Air Max 95 silhouette in olive, blue and black. All three sneakers boast clean minimalism, solely featuring Stussy’s signature branding in pops of color on the tongue, insole and outsole. The neoprene tongue, a la Huarache design, also features Stussy’s logo, encircled by the years commemorating the brand’s 35th anniversary. 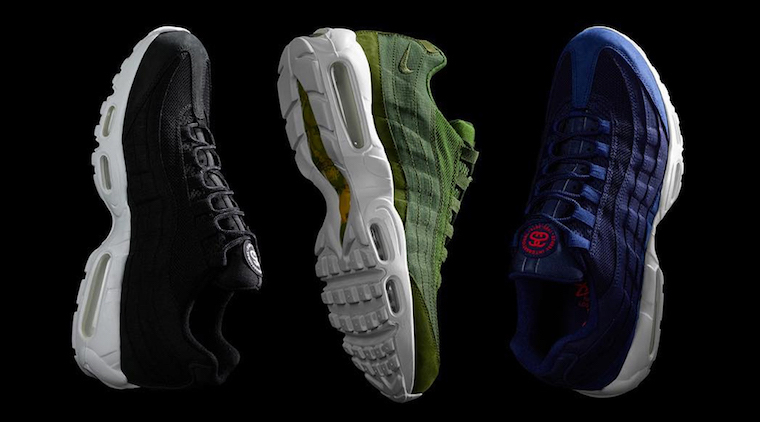 All three colorways of the Stussy x Nike Air Max 95 pack are set for release December 11 at select retailers, including Stussy’s stores and online shop.